Let's talk about vapor production, if you are a true Cloud Chaser. Look no further, this RDA is a 4 coil design that when built corrently will fog out a room in just a couple of rips from your Geyser RDA. 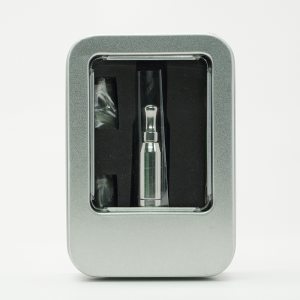 It has a fantastic juice divider allowing you to simply drip directly in the center of your drip tip and your juice will automatically disperse to each coil evenly. Making it easy on you, no need to remove the top piece of your RDA to juice, just drip in the center of your drip tip and you're good to go. Easy Airflow adjustment with 3 different amounts of airflow of your choice. Of course this can be made with 4 coils, 3 coils, 2 coils and a single coil build design. Post Count: 4 seperate posts for an unbelievable 4 coil design build. Comes with:Phillip head screws, mini phillip head screw driver, 1 spare o-ring and 2 pre-built 8 wrap coils from the manufacturer. If you are new to RDA's or building coils, please do not hesitate to shoot us an email. We are here to help and will do everything we can to get you blowing clouds of vapor. Please Note: This product is a Clone. Geyser: Is not valid for Returns or Warranty nor can we provide you a Refund for Geyser due to sterilization reasons.